Congratulations for being the start of something special at SHSU! The next session will begin on Monday, February 10, 2014. Limited spaces are available due to the course’s popularity; if space is unavailable for the February-April cohort, another cohort will be available in June. An announcement for the cohort will be made prior to that time. Course Building: Two-week course that will equip online instructors with building and sharing content in their online courses. Communication: Two-week course that will cover tools of communication, as well as applicable communication strategies for online course management. Assessment: Two-week course that introduces participants to how to get started assessing their student’s learning in an online class. 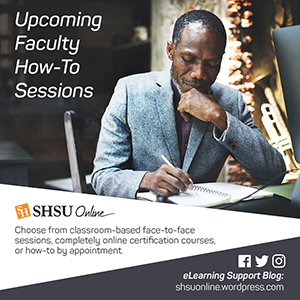 Teaching Online – Strategies for Success: Two-week course that presents participants with the opportunity to explore best practices for creating engaging and effective online learning environments. Last week in this series, we blogged about Column Organization and Feedback within the Grade Center. 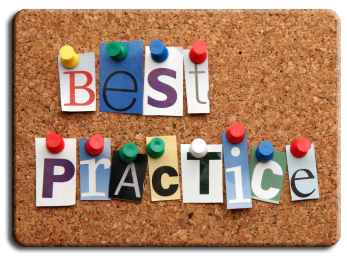 This week we will look at three other Best Practices for Grade Center usage in Blackboard Learn. The Grade History page acts like a log file that records all of the changes that occur to grades within a course, and displays all the data for grade submissions for the course within a set date range. You can manipulate the view and export the information. Access the Grade History page from the Reports drop-down list on the action bar. Select View Grade History to display the page. Date The date you graded the item or changed the grade. Last Edited By The name of the last user to edit the grade. When clicked, you can view the username and role of the person who edited the grade. If the score appears from an automatically graded test, the name is listed as Automatic. Value The value of the grade as viewed in the Grade Center as well as the type of value and entry type, such as attempt grade and override grade. If you associated a rubric with the item, you can view it by clicking View Rubric. Comments Any associated Feedback for User or Grading Notes. Note: The Grade Center History is especially useful when there is any question of a student’s grade or when multiple attempts at an assessment have taken place. Assigning a Due Date for Grade Center columns populates a student’s calendar with the schedule for the course. It also leverages Blackboard’s Notification system to remind the student a week before the item is due via e-mail, the Mobile Learn App and the My Blackboard Dashboard. Note: Looking for a quick way to add a due to Grade Center Items you’ve already created? Click your mouse on the contextual menu that shows up when you hover over the column name and select Edit Column Information. You can then add a due date and re-Submit. One of the challenges encountered when using the Grade Center is viewing as many graded columns as possible on one screen. Now we’ve already addressed one way to alleviate this with Smart Views. However, there is another way to counter the problem with the use of the Grade Center Display Name. When you create a column or edit a previously created column there is a field for Column name and a field for Grade Center Display Name. The Grade Center Display Name allows you to create a shortened title that displays in the grade center so that you can view more grade information across multiple Grade Center views. So, if you created an Assignment called “Assignment 2 – Foundations of Literacy” and realize it is eating up to much space but want to keep the title, just add a Grade Center Display Name of “FOL” to shrink your column width. Note: To add or change the Grade Center Display name, click your mouse on the contextual menu that shows up when you hover over the column name and select Edit Column Information. You can then type in a shortened name and re-Submit. Associate Professor and Director of Graduate Studies for Family and Consumer Sciences, Dr. Paula Tripp compares traditional face-to-face teaching with online teaching.